The above visualization represents some of the core developments in what has been referred to as ‘platform capitalism’. It draws upon the small volume by Nick Srniceck with the same title. In ‘Platform Capitalism’, Srnicek explains how capitalism is defined by succeeding crises, which drive a search for new resources and modes of production to enable value extraction. In platform capitalism, the central resource for capitalist accumulation is data. If data has become a massive new raw material for capitalism, then platforms extract and process this data (Srnicek, p.49). 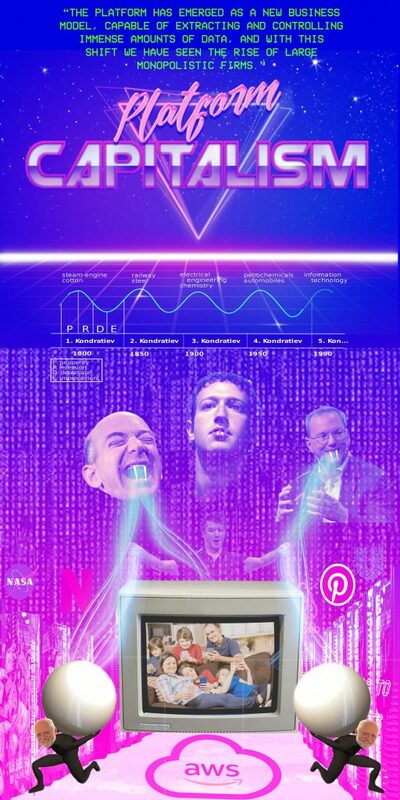 As vampires (Dyer-Whiteford, 2015) they feed off the rich data streams and labor provided by the users of the platforms – from families and legendary space exploration institutes to workers in the gig-economy. Srnicek categorizes different types of platforms. There are the advertising platforms, such as Facebook and Google, which extract and analyze data from on users to sell advertising. The most well known ‘cloud platform’ is probably AWS – renting out hardware and software needed to store all data produced by ever more digitally-dependent businesses. Uber is a classic example of a lean platform, which seeks to connect buyers and sellers of a service while maintaining a minimum of assets and outsourcing as many costs possible. Since platforms are based on the extraction of data and the creation of network effects, they have certain dynamics: “expansion of extraction, positioning as a gatekeeper, convergence of markets, and enclosure of ecosystems.” (Srnicek, p.98). These dynamics lead the different types of platforms to encroach more and more on each others markets, their business models merging. And thus platform capitalism follows that same path towards expansion and monopolization seen so many times in the history of unregulated, naked capitalism; a few ever more powerful companies left, extracting ever more value and accumulating their profits to unimaginable amounts with a baffling speed. Dyers-Witherford, Nick. Cyber-proletariat: global labour in the digital vortex. London: Pluto Press, 2015. Srnicek, Nick. Platform Capitalism. Cambridge and Malden: Polity, 2017. A representation of the current platform capitalist culture.